MUNICH -- German premium carmaker BMW and Japan's Toyota Motor Corp agreed to extend their cooperation to a bigger strategic alliance on Friday in a challenge to global rivals as competition intensifies. The agreement means BMW (BAMXF.PK) will cease further efforts to cooperate with General Motors (GM) and its partner PSA Peugeot Citroen. There were few details of specifics, but the agreement echoes the pact between Mercedes parent Daimler and Renault-Nissan. It could also bolster the two against Volkswagen, which seeks to topple BMW from its top spot in the luxury market with its Audi range, and Toyota (TM) as the world's biggest car producer. BMW chief executive Norbert Reithofer and Toyota's Akio Toyoda signed a statement expressing their intention to work together after separate deals to collaborate in four new fields. BMW and Toyota emphasised that there was no intention of building stakes in each other's businesses. "We are not coming together to become bigger. We are not coming together to form capital ties," Toyoda told reporters In Munich, "I met Chairman Reithofer again today, and I felt the relationship of trust between our two companies grow stronger." As part of the deal, the two companies will work together on fuel cells and electrified powertrains -- for electric cars -- in which Toyota is strong. BMW, meanwhile, can help Toyota reduce its cars' weight. The German company has taken a leading role in carbon fiber, a lightweight, superstrong and expensive material that so far mainly can be found in high end sports cars. 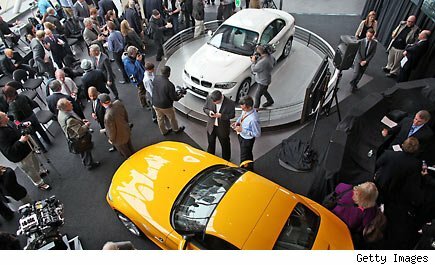 BMW also plans to assist Toyota in developing a sports car architecture, an area where the Japanese company has struggled. A BMW spokesman said that there would now be no more talks on further cooperation with GM. He said discussions were also underway with France's PSA Peugeot Citroen -- allied with GM -- on dissolving a joint venture on components for hybrid cars. Reithofer said, however, that BMW and Peugeot would continue honoring the existing project-based partnership to build small four-cylinder gas engines. Peugeot said last week it was looking at its joint venture with BMW in light of its partnership with GM. Peugeot spokesman Pierre-Olivier Salmon gave no further comment after the BMW-Toyota announcement. For more on this story, visit AOL Autos.